MANILA, Philippines – (Updated December 7) The November 2018 nurse licensure examination (NLE) results or nursing board exam full list of passers, top 10 (topnotchers), top performing schools and performance of schools are available here as officially released by the Professional Regulation Commission (PRC) and Board of Nursing (BoN) on December 7, 2018 or in 14 working days after the last day of exam. Congratulations to our new nurses! UPDATE: 4,811 out of 12,033 passed the Nurse Licensure Examination. "The results of examination with respect to two (2) examinees were withheld pending final determination of their liabilities under the rules and regulations governing licensure examination," PRC said. "Pursuant to PRC Resolution No. 2004-223 dated July 19, 2004, results of examinations are final and request for reconsideration of failing grades is not allowed," PRC added. The November 2018 NLE was conducted in various testing centers nationwide: Manila, all regional Offices and Zamboanga. The members of the Board of Nursing who gave the licensure examination are Glenda S. Arquiza, Chairman; Carmelita C. Divinagracia, Gloria B. Arcos, Cora A. Anonuevo, Carfredda P. Dumlao and Florence C. Cawaon, Members. NLE's verification of ratings (passers, non-passers and removal) can be done online. The two-day exam covered competencies in relation to the 11 key areas of responsibility contained in the Competency Standards of Nursing Practice in the Philippines. These areas are categorized as follows: patient care, empowering, enabling and enhancing competencies. According to PRC Resolution No. 2017-1068, the target date of release of NLE results is on Friday, December 7, 2018. The 'big day' falls in 19 calendar days or in just 14 working days after the last day of exam. The computed number of working days excludes 2 Saturdays and Sundays and 1 public holiday (Bonifacio Day). In the same period last year, results were out in eleven (11) working days after the exams. PRC named 5,875 out of 12,869 who passed the exams. University of Santo Tomas (UST) led the schools with 100% passing rate. Raymund Kernell Balmaceda Manago of University of the Philippines (UP) - Manila aced the board with 89.00%. In the November 2016 NLE, results were released in twelve (12) working days. A total of 6,836 out of 14,322 passed the examinations. University of Santo Tomas (UST) and Benguet State University - La Trinidad topped the schools with 100% passing rate. Southern Luzon State University (SLSU) - Lucban and Saint Louis University (SLU) were among the top performing schools. SLU graduate Eric Carolino Jacinto and UST's Faith Calzado Rutagines topped the board with identical average grade of 86.60%. We advise examinees to monitor release of results starting December 3 (Monday) until December 7 (Friday) or in 10-14 working days after the exams. 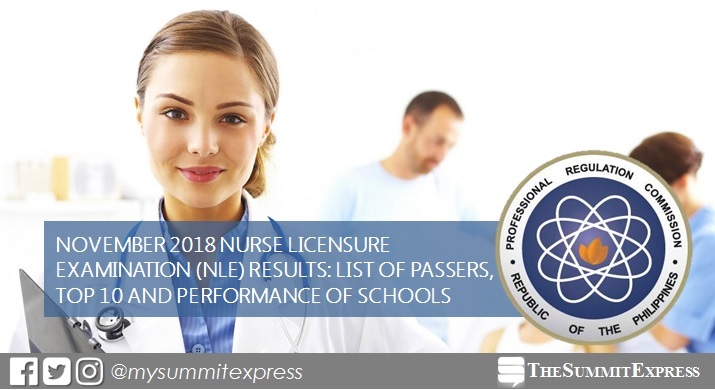 The Summit Express has partnered with PRC Board News to deliver updates before the official release of NLE results. December 6, 2018 Update: Tomorrow is the big day! NLE passers are expected to be released on Friday, December 7, according to a reliable source. December 7, 2018 Update: NLE results are expected to be released today! We will update this page once we got reliable information from our sources. In the previous board exams, takers can expect exact release date of results by always visiting this site. It's also possible that PRC will release results on earlier date than the target date if there's further improvement in the PRC system of checking of results. Monitor this page for more announcements and updates related to nursing board exam. You may also check the official website of PRC (prc.gov.ph) for the results.